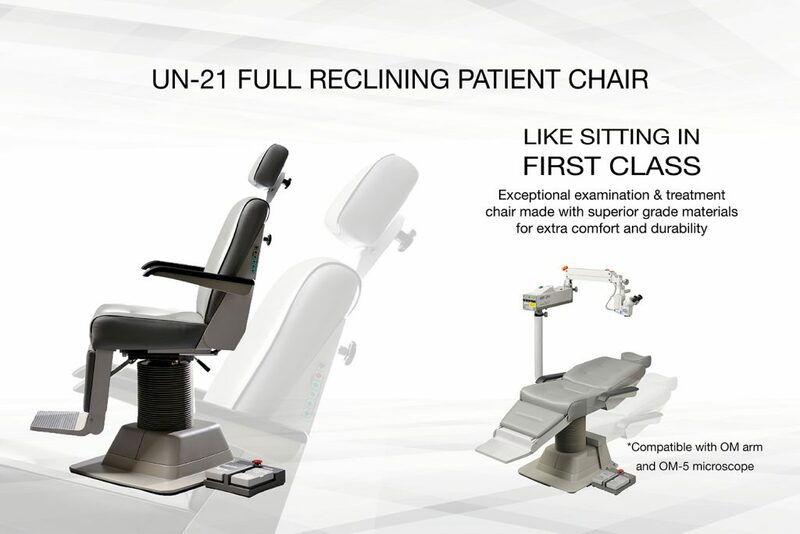 Takagi UN-21, an exceptional examination and treatment chair, and one of our best sellers! The difference stands in the materials, superior grade materials are used for extra comfort and durability. The chair holds the patient comfortably during the whole examination or treatment process, with a maximum load of 150kg. There are extra features that make it quick and easy for both the eye doctor and the patient to find the right position. The result is a distraction-free examination for the eye surgeon or eye professional. A memory mechanism allows preselecting the preferable tilt angle, which can be controlled by using a foot switch. The ophthalmologist can select and save four different pre-sets, which will quickly bring the chair to the position required depending on which eye procedure is performed. With such flexibility and durability, UN-21 is ideal for minor eye procedures, such as eyelid surgeries, intravitreal injections, treatment for the upper or lower eyelid and other injections for age-related macular degeneration, or AMD injections. There is full flexibility for the ophthalmologist to either lift or lower the chair or backward and forward tilting from 65 degrees upright to a full recline. Additionally, for further control, the chair can rotate from 30 degrees clockwise to 225 degrees counter-clockwise, for easy patient access. Once the examination is finished the auto-return function automatically brings the chair to its original position, maximising the clinic’s workflow. This is not all! UN-21 is compatible with ST-50 Smart Table and can be controlled and lowered directly from the table. That’s what we call working efficiently, having full control, and flexibility. Optional components can be easily installed, such as an armrest and I.V. pole as well as an OM arm, for use in combination with Takagi OM-5 operating microscope. In this way, UN-21 becomes a bed for examination and treatment when it’s in a full reclining position. The eye doctor has full control of the commands and the patient has full comfort. Our design and production team has yet again engineered a desirable ophthalmic chair, in its precision and comfort. ©2017 Takagi Ophthalmic Instruments Europe Ltd. All Rights Reserved.